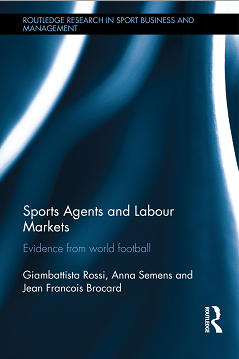 An authoritative academic analysis of the activity of sport player agents in sport labour markets, co-authored by the Birkbeck Sport Business Centre’s Dr Giambattista Rossi, has been published this month by Routledge. Entitled Sports Agents and Labour Markets: Evidence from World Football – the book offers historical, legal, social and economic perspectives on the sports agent profession by drawing on extensive empirical research into the football industry around the world. Dr Rossi’s co-authors are: Dr Francois Brochard, an academic at Birkbeck’s long-term French academic collaboration partner CDES (the Centre for Law & Sport) University of Limoges; and Dr Anna Semens, Head of Analytics at Havas Sport & Entertainment. The book explains how understanding the role of the agent can help increase understanding of labour markets and labour relations in an increasingly globalised sports industry. The book is aimed at academics, students and any professionals interested in the business of sport. “This book goes further than any other in illuminating an important but under-researched aspect of contemporary sport business,” said Dr Rossi. Dr Rossi, whose research in general focuses on sport labour market, was drawn to the topic of sport agents when he received the Joao Havelange scholarship awarded by CIES in 2011. The scholarship resulted in his editing a report on the market of football agents is the Big 5 European football leagues.